And we’re back! Get the good give feels and get after it! In the 6th annual 24-hour charitable challenge, more than $7.4 million was raised for 960 nonprofits from over 18,000 people. Since 2013, more than $42 million has been raised from 251,403 donations for our nonprofit community. 2018 design led by Jake Welchert with photography by Adam Casey. This was the fifth year I was on the project team with Daphne Eck for the Omaha Community Foundation. It was another amazing display of a city who cares about its nonprofit community. More details on Omaha Gives! follow. During Omaha’s 5th annual 24-hour charitable challenge, more than $7.83 million was raised for 923 nonprofits with 52,886 donations. 2017 design led by Jake Welchert with photography by Adam Casey. More than $8.87 million was raised for 789 nonprofits by 18,915 people in 24 hours during Omaha Gives! in 2016. 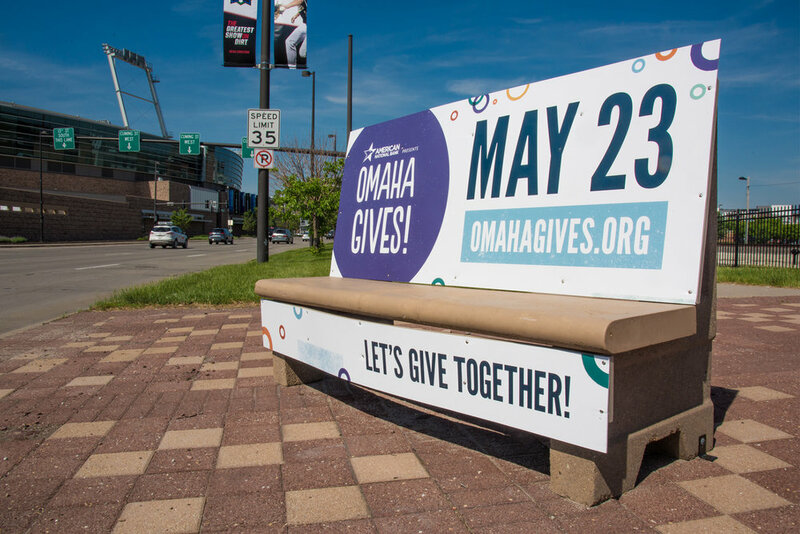 More than $8.8 million was raised for 704 nonprofits by over 20,600 people in 24 hours during Omaha Gives! in 2015. The third annual event hosted by the Omaha Community Foundation was another rousing success showcasing the generosity of the Greater Omaha community. Our team was back together in the months leading up to May 20th as we executed a large set of print and digital materials including mailers, newspaper ads, swag, and social graphics. The design built on the look and feel of the previous years. We still used the floating circles as the core design element and executed a new set of illustrations and infographics to help visually tell the story of 2014 success and to get people excited for 2015. A big part of the effort in 2015 was the design of the website. The new giving platform utilized was developed by CiviCore. We were able to design the home page and set overall website styles to be inline with the Omaha Gives! brand. Site development was executed by Christopher Kollars. In the end, from print to digital, the cohesive campaign design helped deliver another successful year of supporting nonprofits who are doing the hard work every day of making our community better for everyone. More than $6.3 million was raised for 569 nonprofits by 18,176 people in 24 hours during Omaha Gives! in 2014. A 24-hour charitable challenge powered by the Omaha Community Foundation. The goal of Omaha Gives! is to bring the community together to support Omaha by making charitable gifts to local nonprofits. The second annual was a huge success helping to grow more good right here at home as an energetic, fun, competitive, and inclusive event. Picking up on the success of year one, Daphne Eck and myself worked with the OCF team to create a brand to raise awareness for local nonprofits, celebrate the collective effort, and show-off Omaha’s spirit of giving. Expanding on the Omaha Gives! logo which was designed by Oxide Design Co, we designed the campaign as a mutli-colored network of big and small, working together to celebrate the story of giving. In the months leading up to May 21st, we executed a large set of print and digital materials including mailers, newspaper ads, nonprofit swag, social graphics, and other web assets.